The arrival of Boxing Day heralds the punishing of my bank account. This year was no exception. Between the sale at my local Wizards and at Mission Games, my wallet is a fair bit lighter. 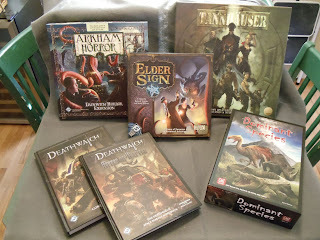 So I picked up Tannhauser, the Dunwich Horror expansion for Arkham Horror, Elder Signs, Dominant Species and a couple books for the Deathwatch RPG. I also picked up 3 game expansions (not shown) for a friend of mine. I'm still trying to get my remaining 16 Vikings done before the end of the year. I should be able to get them done. Your vikings cry out for paint! By Thor's hammer, get busy sir!